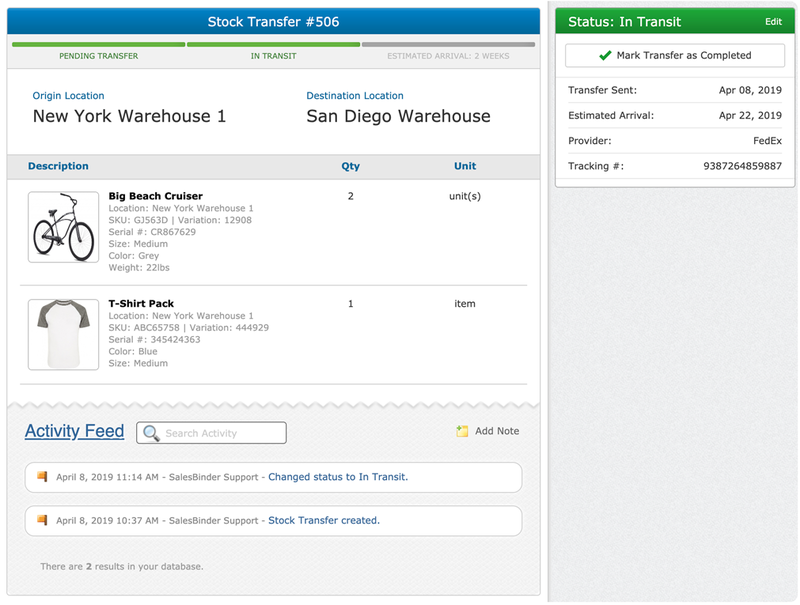 Today we’re announcing a brand new feature in SalesBinder for doing inventory stock transfers. Although we have always supported basic transferring of stock, we’ve created an entirely new document for bulk transferring goods from one location to another. Creating a stock transfer allows you to move many inventory items from one of your locations to a different location. There’s no limit to the number of items you can transfer and you can even scan barcoded inventory into the stock transfer document just like creating a new order. Stock Transfers have 3 different statuses based on what stage of the transfer process it’s in. Pending Transfer: Initially saving a stock transfer will place it in a “pending transfer” status. This means your inventory quantities have not moved yet and quantities have not been adjusted. In Transit: Once you actually ship out your stock you can mark it as sent (while optionally entering the shipping/tracking/ETA information). When it’s been sent the status will be “in transit” and your origin’s inventory levels will be moved into your destination’s “in transit” quantity levels. Completed: Once your stock arrives at your destination location you can mark it as received and those “in transit” quantities will now be moved into the regular on-hand quantities. You can also print out nicely formatted PDF copies of the stock transfers to accompany the shipment and/or provide to your receiving location to verify the shipment. Once you start using stock transfers a lot you’ll likely want to make use of our great reporting tools to keep track of everything. From the Stock Transfers List you can use our handy filtering tools that you’ve been accustomed to throughout our software. 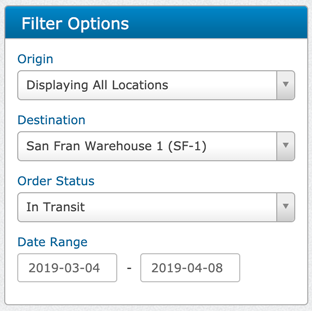 This enables you to filter your list by an origin location, a destination location, the status, and a specific date-range. You can also search by stock transfer number, or even a shipping tracking code. In addition to this, you can export this data as a CSV spreadsheet file and the exported data will also follow your filters (if any are currently applied). We hope you find these new stock transferring tools useful. If you have any feedback, we’d love to hear it!